The Old Bailey is at last living up to its name, having turned 100 today. The famous courthouse was completed in 1907 on the site of Newgate prison, and has since sent down some of London's greatest crooks and butchers. During that century figures as diverse as Dr Crippen and the Kray Twins, Jeremy Thorpe and the Yorkshire Ripper, and Ruth Ellis and Lord Haw-Haw, have risen to the court usher's instructions of "silence and be upstanding". The old lady was today visited by another old lady. The Real Queen (as she must now be called) decided to make a royal visit rather than send the customary centenary telegram. It was her Majesty's pleasure to unveil a plaque marking the occasion. 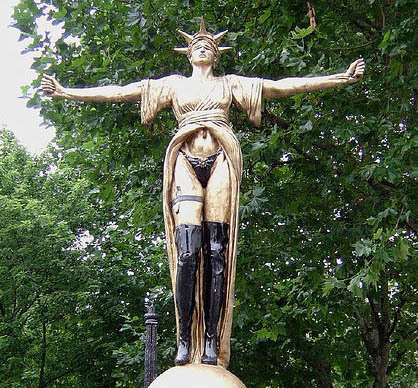 Aside from famous trials, the court is also famous for its golden figure of Justice, who has weathered showers and storms atop the Old Bailey's dome for 100 years. Banksy recently depicted her as a whore in a dollar-stuffed garter (image from What What's Flickr photostream). People googling for golden showers from 100 year old whores: that last paragraph was a deliberate entrapment. A message containing your IP address has been sent to the authorities.